I am afraid I do not like candy. Is this even normal? And I love chocolate. But not candy. Boo hoo. This pic is by Mary Engelbreit. You can visit the hop at Crazy for Books. Love the pic! Thanks for stopping by my blog! Your blog is beautiful!! I can't believe you don't like candy. That's pretty crazy! :-) Gum is great tho. hi again Christy! thanks for stopping by and for the follow. Burgandy Ice, what a lovely name you have... I followed you back. Thanks for stopping by my blog! Have a great week! 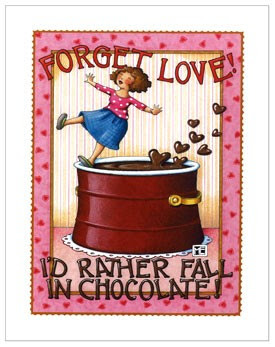 I love chocolate too. Thank you for visiting my blog and commenting.